Since Halloween is less than 24 hours away, I thought I’d share my favorite candy with you. Peanut butter and chocolate is pretty hard to beat. Whoever invented that fabulous combination deserves some kind of a price. Seriously. 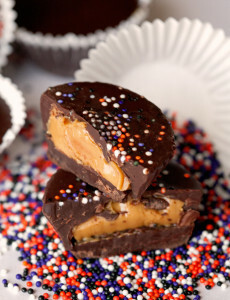 While I happen to have other favorites, Peanut Butter Cups are my first choice almost every time followed by Snickers. With the success of copying the famous Reese’s Cups, I am getting giddy just thinking about the endless possibilities of candy-making in the comfort of my own home. Did I mention that you’ll only need 2 ingredients to produce your own PB Cups? 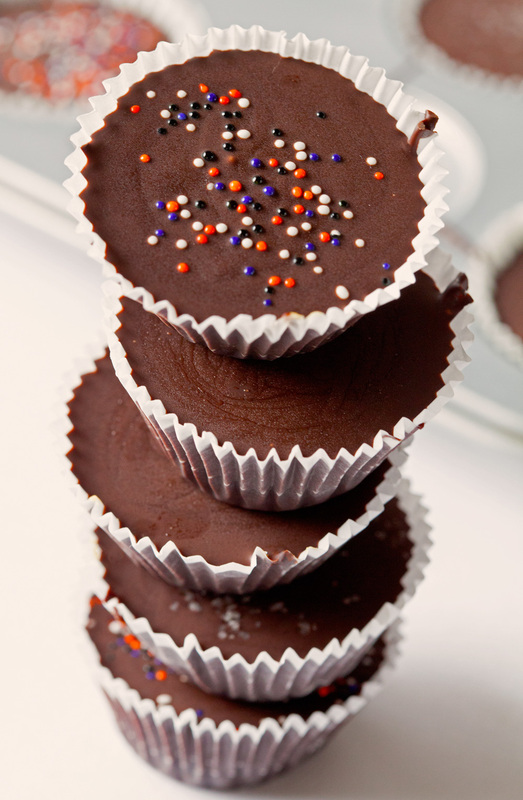 Yes, it’s true – easy, peasy, out-of this-world-lip-smacking Chocolate Cups filled with rich and creamy peanut butter are about to boggle your mind. Here we go! There’s no turning back if you continue to read this post. 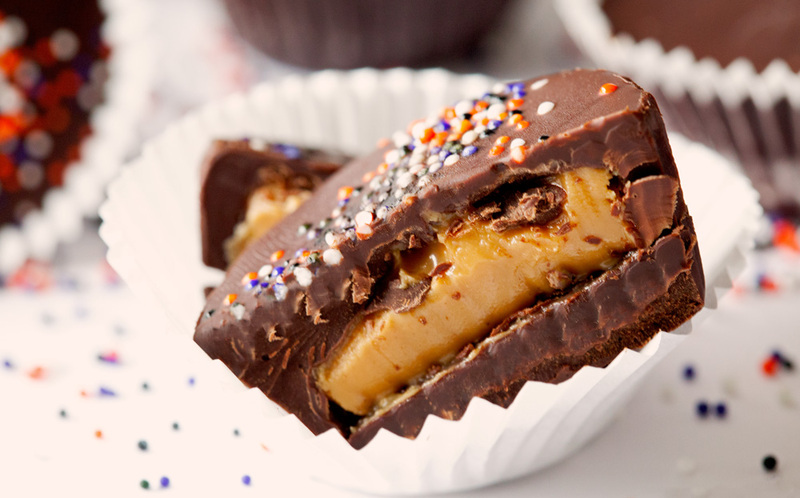 You will never be able to forget how to make Peanut Butter Cups in a matter of minutes, which means every time you have peanut butter and chocolate around, you might be tempted to turn them into these. It really is ridiculous how simple it is to make your own. 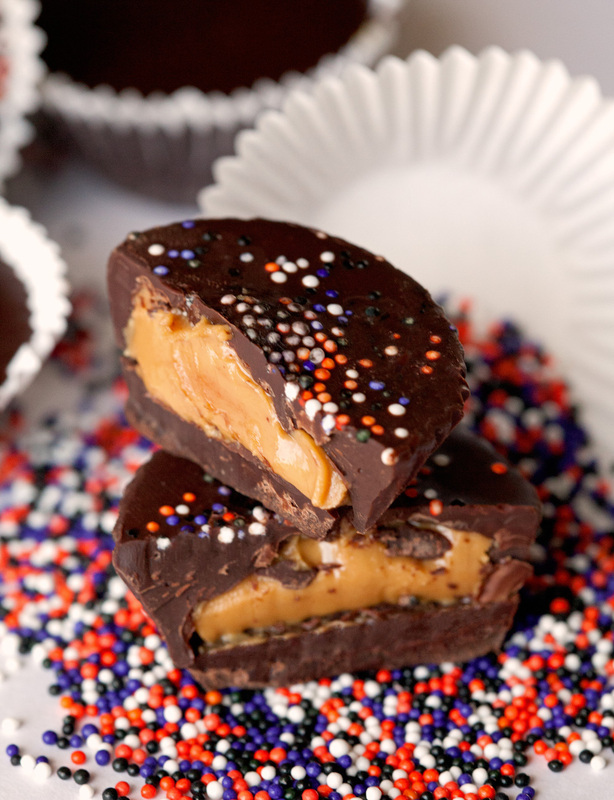 In keeping with the Halloween Spirit, I added seasonal sprinkles to my peanut butter cups. I also topped some with sea salt and enjoyed a few plain and simple. I loved all of them, but I do have to admit that the sea salt was probably my favorite version. Creamy Peanut Butter is the sole ingredient that fills the center of each cup. I wasn’t quite sure if stuffing the middle with peanut butter and only peanut butter was the best move, but who was I kidding? I absolutely adored it. Dense, rich, and fudgy was the final verdict. The center is not as sweet as the regular version and that was the best part. You’re able to taste and enjoy the chocolate a lot more as the peanut butter really lets it shine. So, what is your favorite candy? Let me know and maybe I will recreate yours. Like I mentioned earlier, I can’t wait for more! Here’s the recipe for ya. Have a spooktacular Hallows’ Eve. Muahahaha!!! 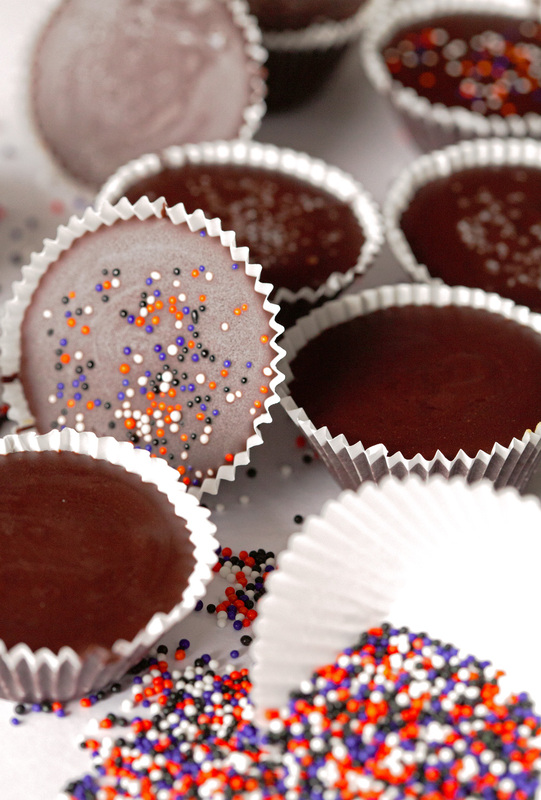 Peanut Butter Cups are rich, fudgy and incredibly easy to make... with only 2 ingredients. 1. Melt half the chocolate chips in the microwave in 30 second intervals until melted. You can also use a double boiler. 2. Fill the bottom of each liner with the melted chocolate - just enough to cover it, about 1 teaspoon. Put the muffin pan into your fridge for 30 minutes or until chocolate is set. 3. While the chocolate finishes cooling, melt the remaining chocolate chips and set aside. Take the muffin pan out of the fridge and place a dollop of peanut butter (about 1/2 teaspoon) in the center of each chocolate bottom; try to avoid touching the side of the liners. 4. Spoon the melted chocolate over the peanut butter - enough to cover the top and fill the cracks. Top with sprinkles of your choice or sea salt. 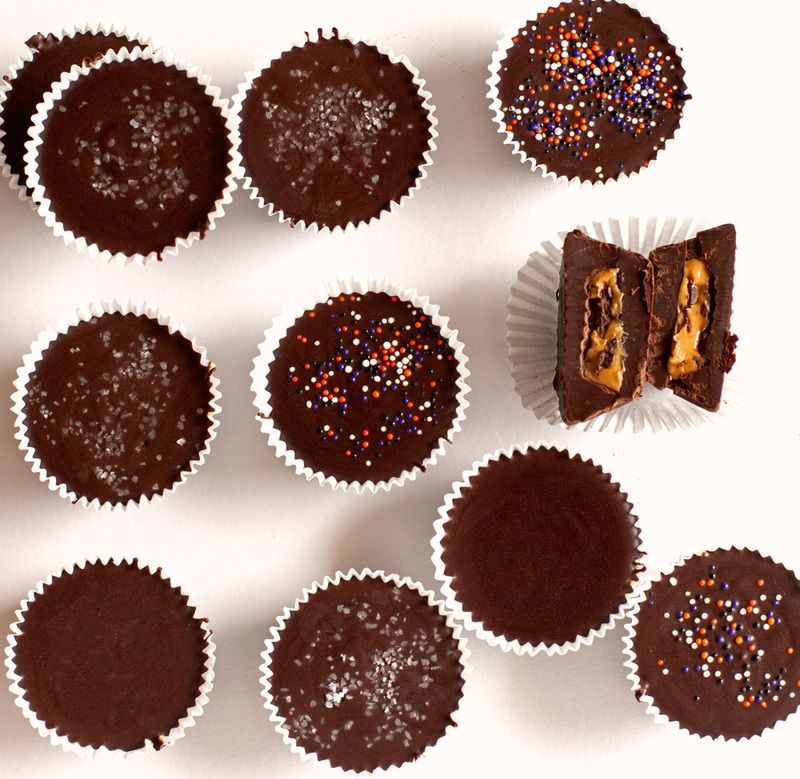 Peanut Butter Cups will keep up to 3 days or 4 weeks in the freezer. Hell0- I was wondering what kind of pb did you use? I used regular creamy peanut butter. Thanks, Alana!